Thanks once again for a great trip to Onaman Lake. The extraordinary fishing, comfortable cabins and beds, combined with your hospitality makes this trip a continuing annual event for my family and friends. We always enjoy the wildlife while on Picnic Island and Onaman Lake, especially Moses your resident bull moose. You have always asked us if there was anything you could do to make our stay better, and with complete honesty we cannot. Next year will be our 6th year with you and with any luck many more. Stay well until we see you next year, and have a great season. Thank you so much for the wonderful week in Onaman. We are trying to convince our kids to come next year, and make it a family reunion. We have a 6 mo. old grandson, and a 7 year old grandson. Are the prices the same for them and can the 8( by then) year old get a fishing license? We will bring as many as possible and will be in touch as the months go by. We just want you to know, that your hospitality and friendliness toward your customers far exceeds anything we have ever experienced . This comes from a group of people who have traveled extensively to many foreign and domestic locations. All of the people in our party agree, this was the best fishing trip any of us have ever had. PS Please feel free to publish our comments about the hospitality and friendliness. We felt like we had to leave 3 of our best friends this morning. Here are some of my thoughts on Onaman Lake. This will be year 15 for our group of Fathers and Sons! Onaman Lake has provided all of us with so many wonderful fishing memories, from countless hours of non-stop slip-bobber fishing for walleyes to casting for monster pike in the weed beds. 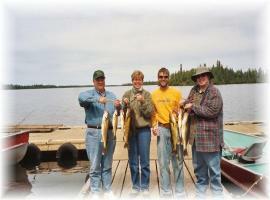 Onaman Lake has given our group a great number of �first time� experiences. There have been clear nights exploding with the beautiful colors of the Northern Lights. Caribou, Moose, Eagles, Osprey and all the other wildlife always make each trip a unique experience. The shore lunches are always a favorite for everyone and there is always a new place to discover and enjoy a bite of food and a beverage and just take in the natural beauty of the surroundings. Poker games in the cabins at night always make for good stories the next day and for years to come. The cabins are great! The North Camp is perfect for us, it still is rustic, which we love, yet has some very convenient amenities like running water and solar lights. Mike has really made our trips really enjoyable by always having the cabins in great shape and the little improvements and updates each year are great, but the cabin still seems to keep its rustic appeal. The island has beautiful, more modernized, cabins that would be great for families. We prefer to get away from everyone else and enjoy nature and the company of our group so we enjoy the seclusion of the North Camp. We have literally caught thousands and thousands of really nice sized walleyes over the years and hundreds of big pike. The largest of the pike was caught by Darryl a couple years ago, 44� and 23 lbs. It was a monster and was released for someone to hopefully catch again. The one week a year we get to spend up at Lake Onaman is truly the highlight of my and many others year. I can�t wait to get up there again and catch some more of those beautiful walleye! I�m catching a monster pike this year! The facilities on Onaman Lake, Picnic Island are very comfortable . Very well kept log cabins, with wood stove, kitchen and living area, nice bunks, fire pit ,cool island setting with great sunset view. I have hunted moose 4 years and my group has killed 4 moose. One bull making Pope and Young. The fishing is great ,and also seem to taste much better there. Mike, Carol, and miss Emily are very helpful and capable staff, and soon become good friends, a vacation here is highly recommended by this repeat customer. The walleye fishing on Onaman Lake is fantastic. When the fish are turned on, I wouldn't want to be on any other lake. Last year we had trouble catching walleye that were less than 18". The average was 20"+ !!. We have been fishing in Canada for over 20 years and have followed Mike and Carol Bauer for a good portion of that. Mike and Carol are excellent hosts with excellent facilities. On the drive home, we already start talking about next years trip. Our annual fishing trip has turned into a family tradition and the memories I have of fishing with my Dad, Brother, Father In-Law, Uncle, and family friends will last a lifetime! Spring is in the air and Christine and I have Walleye on our minds. We can hardly wait for July to arrive so we can pack our bags, leave the rat-race behind and head back to Onaman Lake for another week of great relaxation, beautiful scenery and outstanding fishing! We've been talking with some of our friends that fish who have never experienced what it�s like to catch fish on a lake as big as Onaman without seeing boats from other camps. They can't quite picture a 28,000 acre lake that is miles long, but limited to one outfitter. We see you�ve added a satellite picture of Onaman Lake to the website, which should help us prove that we�re not just telling them �fish stories�. The other thing they seem to be suspicious about is when we tell them that Onaman is known as �The Fish Factory�. Fortunately, we have plenty of pictures from our trips during the past several years to prove that catching an abundance of Walleye and Northern on Onaman is the rule, not the exception. I've included a couple of shots that we look at throughout the winter to remind us there�s light at the end of the tunnel. On a side note, the guys are all set for our August fly-in. There will be four of us for that trip with one being new to the experience. I can't wait to see his face when we get off the plane at Picnic Island and he gets his first look at fishing paradise. He loves to fish and I've told him he�s in for one of the best vacations of his life! I know as always you, Carol and Emily will do your best to prove me right. We look forward to seeing you soon. Keep your tip up! I have been introduced to Canadian fishing by friends more than 40 years ago, I have experienced both �Housekeeping and American Plans�. After a number of different outfitters, we happened on Mike and Carol while they were managing a camp offering the American plan. We were so impressed with the wonderful treatment and attention to detail that there is no question that Mike and Carol are the �BEST� Outfitters in Ontario Canada and that was 20 years ago! I have been following Mike and Carol ever since. I have been giving testimonials and recommendations to people whom I have never met and will continue to do so. When I speak of detail, Carol can of this date tell me where my party sat in the lodge for meals 20 years ago. She is an excellent cook and Mike and Carol both recall names of present and past customers. The fishing on �Onaman� Lake is worth the drive, Walleye are extremely active, fighting like an angry Bass or a hungry �Northern� all the way to the top. Its difficult to find eighteen inch and under fish, 20 inch+ is the norm. This lake lives up to its label as �FISH FACTORY�! There is an abundance of wild life to observe, Moose, Eagles Pelican�s, yes; Pelicans come up from California in the summer time. The scenery is breathtaking. This is also an opportunity to meet with good friends whom I see only once a year. In addition to friends, I have fished with both of my sons and son in law, his father, brothers in law and many close friends. You do not need to attend an �Outfitters show� to find these folks. You will want to rebook once you have been here! There has never been a disappointment regarding these trips, I will always come back to �Mike and Carol�s� camp. I have been doing annual fly-ins (sometimes 2 a year) to Onaman Lake since 1970. The phrase "limits in minutes" still applies to this fantastic walleye and northern pike lake. The 23 lb northern on my family room wall reminds me daily of the 40 plus trips my fishing buddies and I have taken. I have not had one Onaman trip where we have not been satisfied with the quality and quantity of the fishing. The designation of the lake as a "fish sanctuary" a few years ago has amazingly IMPROVED the fishing on the lake! Three to four pound walleyes have become common! Lots a fun with catch and release of the big ones; and plenty of 17 inchers for shore lunch! Mike and Carol are fantastic hosts; and have done a SUPER job since they took over the operation! Don't miss Mike's fishing stories and Carol's great homemade bread! Thanks for another great week on Onaman Lake. Each trip north is better than the last one. The plane rides are always exciting; your cabins are clean and comfortable; the boats run perfectly; fishing is fantastic; Emily keeps everybody and everything shipshape; and Carol�s homemade bread makes great meals even better! As you know, a few years back, we made the big mistake of going with another outfitter in Minnesota. Never again!! Onaman Lake is heads above anyone else. You guys set the standard on what a remote fishing camp should be. We keep telling our friends here in Ohio and Michigan about Bauer's. Watch for some more reservations to come in. Told some of the guys I was sending you a letter. Pete said to tell you, �This is truly a great fishing experience. I caught my first walleye and pike ever at Onaman Lake. Thanks!� Gary says: �My first fishing trip way up North and what GREAT time. Mike, Carol and Emily were GREAT. The fishing was GREAT. My fishing partner (Wayne) was so-so, but he'll get better when he learns how to fish. Overall, as "Tony the Tiger" would say...it was GREEEEEAAAATTTT!!!! Bob � well, he don�t talk much � besides, he�s busy buying more tackle and the trip is still 4 months away! The boys - Bob, Darrell, Joe, Roger, Dave, Pete, Larry and I will be back this September for our 6th trip to Onaman Lake. It�s a tradition. Until then, keep the planes flying, the fish biting, and the cabins warm. OK guys, where are we going to go fishing next year? Maybe lake X or Lake Z? Nah, lets go back to where they know your name. Not the walleyes, Mike, Carol and Emily of course. What a combination, great friends and great fishing, and great accommodations If we had a better cook we'd have great food too! It just doesn't get any better than this. We talk and plan about this trip all year, can't wait till next year at Onaman. Really guys!! we like to say nice things about you, we mean it, you don't have to pay us, Really!! Well maybe a small shore lunch would Be nice. We love you guys and are anxiously waiting our turn in July. Just a short note to thank you for your outstanding hospitality and kindnesses to me when I was able to enjoy my fishing trip to your fine facilities. We completed our trip on Sunday back to Ohio, and I then came on to my home here in Dallas. Your operation is outstanding! From the planning to the kind handshake upon our deplaning, to the attention to each departure and arrival of these fishermen, you have earned my earnest and heartfelt thanks. I will not hesitate to recommend you to anyone I know for a great vacation spot, and I hope to see you again with my family. Moses is a welcome moose! Maybe we did not fill out our limit of take-home Northern, but we did enjoy what we caught, and the Walleye were simply outstanding. We now understand the limits that have been established, and will continue to abide by those limits. Your knowledge of the best fishing spots and your ready advice are worthy of note. Wish I had more vacation time, but your spot made this season worth remembering. I just wanted to say thanks again for another outstanding fishing trip. Alex and Ryan are already talking about next year and what they want to bring. You guys are "top notch" in service (Emily getting a ladder and climbing the tree to get my lure that Ryan put in the tree!!!!!!!) from any camp I have ever been to. This year's trip was one I will remember for a life time having both of my boys with me and having them catch fish that ALL of their friends (and mine) will be jealous of!!!! Thanks again for your hospitality and we are already planning a shopping trip soon for next year!!!!!!!!!! !